When you've got to go, you've got to go. The convenience. The smallest room. The privy. The head. The jakes. The cloakroom. The khazi. The water closet. The john. The loo. The dunny. The necessary room. The ladies' or gentlemens' room. The restroom. The little girls' or boys' room. The can. The pot. The crapper. The bog. The shithouse. The meeting room for the brown masses. And last but not least- the thunderbox. It has many names. And while fiction might seem to spend most of its time pretending they don't exist, there are still plenty of tropes relating to bodily functions and the rooms we set aside for them. Bath Kick: Kicking one's leg up in the bath. Baths Are Fun: Taking a bath is enjoyable. Bathroom Breakout: Someone uses a bathroom break to cover an escape attempt. Bathroom Stall Graffiti: Notes people leave on bathroom stalls. Bathroom Stall of Overheard Insults: A character overhears other characters insulting them from a lavatory stall. Bird-Poop Gag: A bird poops on something or somebody. Bladder of Steel: Video game feats or achievements that require all but supernatural bladder control. Bottomless Bladder: A video game character never goes to the bathroom even though you've been in complete control of them for 72 straight hours. Bowel-Breaking Bricks: The onomatopoeia version of Oh, Crap!. Bring My Brown Pants: Wetting or soiling oneself out of fear. Brown Note: A device or technique that causes the victim to experience Potty Failure or in any other way have something bad happen to them. Calling Your Bathroom Breaks: A character cannot resist announcing their need to use the restroom. Camping a Crapper: Someone wanting to kill someone waits for his or her target to go to the bathroom before making their move. The Can Kicked Him: Some poor soul is attacked or even killed with a toilet. The Diaper Change: The inevitable moment in any comedy involving a baby where someone gets more than they bargained for and has to change the baby's diaper. Disgusting Public Toilet: A public bathroom, usually at a gas station or on a bus, that is so foul that a dog wouldn't crap on the floor. Dung Fu: Thrown excrement used as a weapon. Embarrassing Damp Sheets: Wetting your bed. Excrement Statement: A character relieves themself on someone or something as insult. First Period Panic: A preteen/teen girl panics over menarche. In extreme cases she doesn't know blood appearing on her underwear is normal. Flushing Toilet, Screaming Shower: If you flush the toilet or turn the tap on, someone in the shower will scream. Goodies in the Toilets: Toilets are the new crates and barrels. Hates Baths: A character hates taking a bath. Jar Potty: Using a portable container as an improvised toilet. Laxative Prank: One character drugs another secretly with laxatives. In a wacky comedy, Hilarity Ensues. In a deconstructive drama, severe dehydration and criminal charges ensue. Male Restroom Etiquette: The strict unwritten code of conduct of the Men's Room. Nature Tinkling: Using the outside world as a toilet. No Dead Body Poops: In Real Life a body's bowels will often unclench after it dies. In fiction, this is usually glossed over or ignored. No Periods, Period: A female character's period doesn't impact the story, even when it probably should. Nobody Poops: A work flat out ignores that living creatures excrete waste in any way. Only Useful as Toilet Paper: When literary writing is seen as such poor quality that it's only fit to be used as toilet paper (or similar undignified uses). Plumber's Crack: What you might see as your bathroom fixtures are being repaired. When the upper part of somebody's buttcrack protrudes above the top of their lower clothing as they bend over, stereotypically associated with plumbers. Pooping Food: A creature that poops out normal food. Potty Dance: When a character (especially a young child) needs to go very badly, they will jump around a little bit. Potty Emergency: A character needs the toilet now. Potty Failure: The inevitable result of a Potty Emergency that goes unresolved for too long. Putting the Pee in Pool: Did this water just get warmer? If it did, maybe someone peed in it. Rip Van Tinkle: After prolonged inactivity, someone needs a bathroom right now! Searching the Stalls: Hunting for someone hiding in a bathroom stall. Swirlie: A character sticks another character's head into the toilet. Flushing is optional. Also known as bog washing. Tinkle in the Eye: When a human baby pees on somebody. Toilet Humour: Disgusting bodily functions played for comedy. Toilet Training Plot: A plot that focuses on someone being toilet trained. Toilet Paper Substitute: No paper? How about $100 bills? Toilet Paper Trail: Somebody leaves the bathroom and a sheet of toilet paper is stuck to their foot. Toilet Teleportation: Flushing yourself down the toilet to escape to somewhere. Urine Trouble: A character/object is urinated on by an animal, usually for comedic purposes. 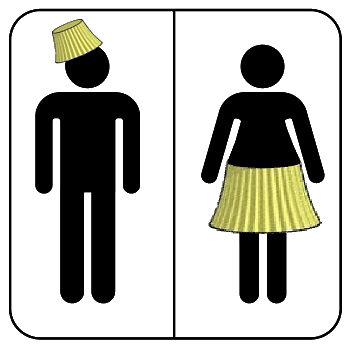 "Which Restroom" Dilemma: A character can't tell the mens and ladies rooms apart. Wondrous Ladies Room: In fiction, the ladies' room takes on a kind of mystique.